'Star Trek: Into Darkness' follows the crew of the Enterprise as a shocking act of terror on Earth sends them on a manhunt to capture an unstoppable force of destruction and bring those responsible to justice. Making its highly-anticipated debut on Blu-ray and DVD on 18th September 2013, the 'Star Trek: Into Darkness' discs are bursting with behind-the-scenes material detailing how the filmmakers delivered a rousing epic filled with both spectacle and soul. The film is directed by J.J. Abrams and features an outstanding ensemble cast including Chris Pine, Zachary Quinto, Simon Pegg, Benedict Cumberbatch, Karl Urban, John Cho, Alice Eve, Bruce Greenwood, Zoe Saldana, Peter Weller and Anton Yelchin. The 'Star Trek: Into Darkness' competition has now closed. Winners will be announced shortly. Competition opens at 5pm AEST on Sunday 15th September 2013 and closes at 11:59pm AEST on Sunday 22nd September 2013. Five winners will be chosen at random on Monday 23rd September 2013. To successfully win, entrants must fulfil the above entry conditions before the time the competition closes. Current members/followers are eligible to enter the competition. Only one entry per person. Only one winner per household. To be a valid winner, the entrant must not have won a prize from SWITCH within the last 28 days. 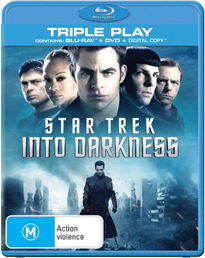 Each winner will receive one Triple Play (3D Blu-ray, Blu-ray and Digital) copy of 'Star Trek: Into Darkness'. By entering, you agree to receive occasional emails from SWITCH in the future. If you decide to unsubscribe from these updates, any further entries will not be applicable. Only Australian residents are eligible to enter. 'Star Trek: Into Darkness' is available on 3D Superset (3D Blu-ray, Blu-ray, DVD and Digital), Digital Download, DVD and Triple Play (3D Blu-ray, Blu-ray and Digital) on Wednesday the 18th September 2013 from Paramount.